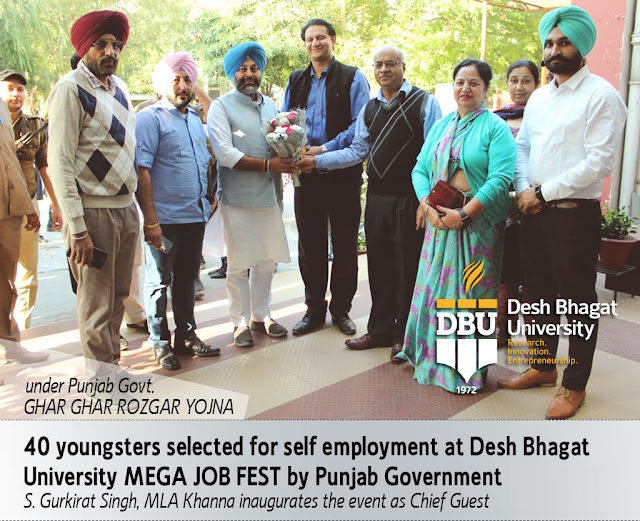 Punjab Government under the scheme GHAR GHAR ROZGAAR organized a State Level Mega Job Fest at Desh Bhagat University, in best university in Punjab and top universities in India. The three day long fest targeted the students who are Graduates, Post Graduate in various streams like Management, Engineering, Business Administration and Computer Applications etc. The Fair was attended by large no of students from all over Punjab. 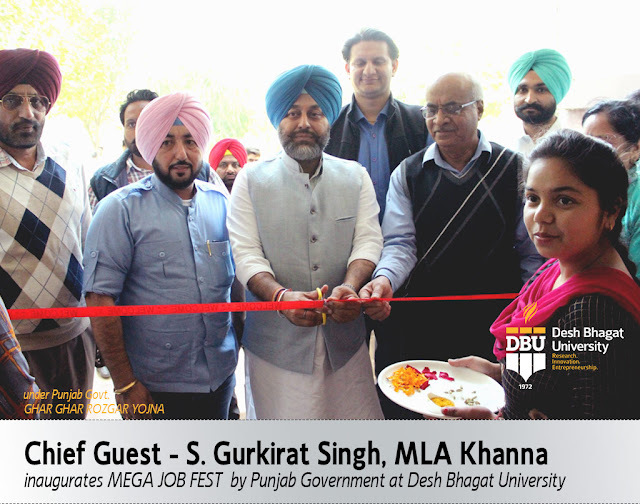 On the last day of Maga Job Fair Chief Guest S. Gurkirat Singh MLA Khanna inaugurated the function by ribbon cutting ceremony. All guests graced the occasion by their presence. On this occasion S. Gurkirat Singh said that this mega job fair will provide jobs to the youth, the Government has been organizing such job fairs on regular basis for providing suitable employment opportunities to candidates. While giving details ADC S. Jaspreet Singh said in this Mega Event more than 40 well-known National and Multinational companies like SBI, Reliance JIO, Orane, Sportking, Cinif Technology, Touch Stone, Willowood Crop, C S Soft Solution, Solitaire Infosys, Kotak Mahindra Bank, Pix India Pvt. Limited, Edelweiss, Aviator Hub, Hoshiarpur Automobiles were participated. On first day 133, second day 148 and third day 117 youngsters were selected for jobs and more than 40 youngsters were selected for self employment. Pro Chancellor Dr. Tajinder Kaur expressed that the Job Fair initiative by Govt. of Punjab in collaboration with educational institutes would provide a golden opportunity to youth of the state to get jobs. In best university in Punjab and top universities in North India, Desh Bhagat United Vice-President Er. Sandeep Singh said that the University organizes such Mega Fairs from time to time. The fair provided an opportunity to deserving students to get jobs in companies of national as well as international repute. Selected students appreciated the efforts of Desh Bhagat University and Punjab Government as they felt that they could have never got such a job through their own resources.